U.S. Rep. Steve Scalise touted the virtues of civility and bipartisanship in Washington and his strong relationship across the aisle with Democratic colleague Rep. Cedric Richmond on Wednesday in New Orleans, even while simultaneously defending a President whose public insults and attacks on perceived enemies is the foundation of his personal style. 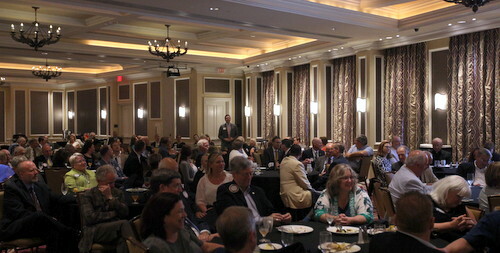 Speaking at a lunch meeting of the Rotary Club of New Orleans at Harrah’s Hotel, Scalise opened his remarks by reflecting on the miraculous recovery that allowed him to return to the annual Congressional softball game a year after being shot there, then used his ballfield rivalry with Richmond to segue into a discussion of their ability to collaborate on major issues of importance to Louisiana. Coastal restoration, dredging the Mississippi River, funding new medical research, and most recently renewing the National Flood Insurance Program are all areas where the two have crossed party lines to ensure the passage of legislation that had stalled due to fighting within the Republican Party, Scalise said. He doesn’t expect to be able to work with Richmond all the time, he said, such as when he is working on a bill to repeal Obamcare. But the way he and Richmond handle their opposing viewpoints on healthcare, he said, is crucial to allowing them to call each other up when they need bipartisan help on other issues. “There are issues where we really do have differences of opinion,” Scalise said. “It’s always been that way throughout our country’s history, and it’s always going to be that way. I think the difference is how we treat each other when we disagree, and that’s where I do think we’ve seen a breakdown over the last couple of years. 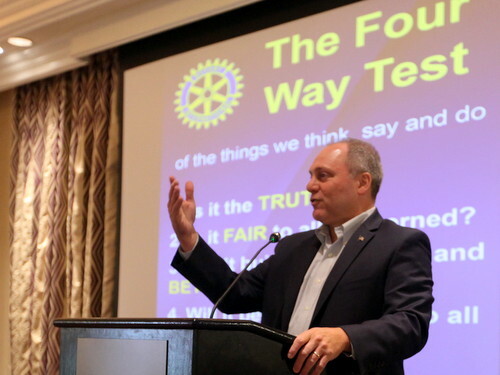 During the question-and-answer session with nearly 100 local leaders in business, education and other fields, however, Scalise was asked how he squares that call for personal civility with his own relationship with President Trump, who regularly belittles anyone with whom he finds himself in disagreement. Scalise said he doesn’t follow Trump on Twitter, where Trump’s comments generate daily headlines. While Trump has effectively used the platform to reach his followers directly, in private the President is “very warm and personal,” Scalise said. One member of the Rotary audience, Rabbi David Gerber of Congregation Gates of Prayer in Metairie, said he was heartened by Scalise’s call for healthy discourse and strong bipartisan debate. Gerber urged Scalise to use his own Twitter account as a counterpoint to the toxic political climate, and even to be more public in touting the value of working with Democrats. “In a place where there are no men, strive to be a man,” Gerber said, quoting the Talmud. Scalise also fielded a few questions about his own political future. To the first question from the audience — whether he planned to run for governor — he emphatically answered “No!” He then pointed out that he has five opponents of his own in the November mid-terms — including Tammy Savoie, whom local Democrats have begun to hail as their first viable challenger for Scalise’s seat in decades — in addition to helping campaign for Republicans in swing districts across the country. 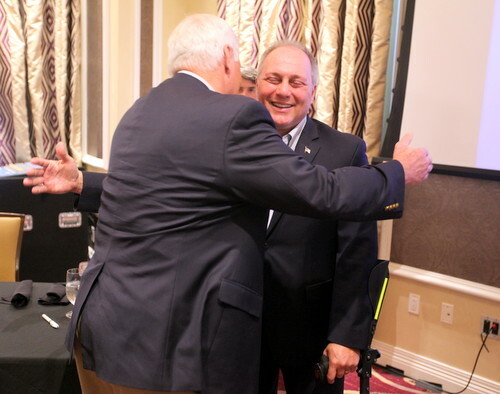 After his address, Scalise said he would be open to debating his opponents in his district during the campaign. 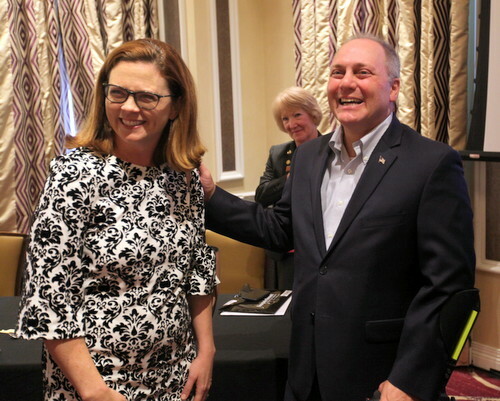 “There are three Democrats that are running for the First Congressional District, so within the Democrat party I’m sure they’re going to be fighting it out to see who has the highest percentage,” Scalise said, while noting that the November election will be an open primary with all candidates at once. The most recent electoral forum he attended in his last election cycle, Scalise said, was with the Alliance for Good Government.